by Randy McDaniel. Softbound, 174 pages, 8-1/2" x 11". 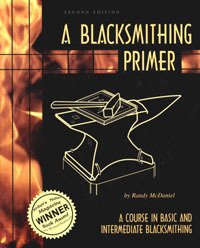 A course in basic and intermediate blacksmithing. All you need to know about forging in one book. Includes step-by-step illustrations and text; setting up shop; forging and heat treating tools; forge welding; forging scrolls, leaves, heads and more; plans to fabricate your own coal forge and anvil. More than 20 projects and over 400 drawings.